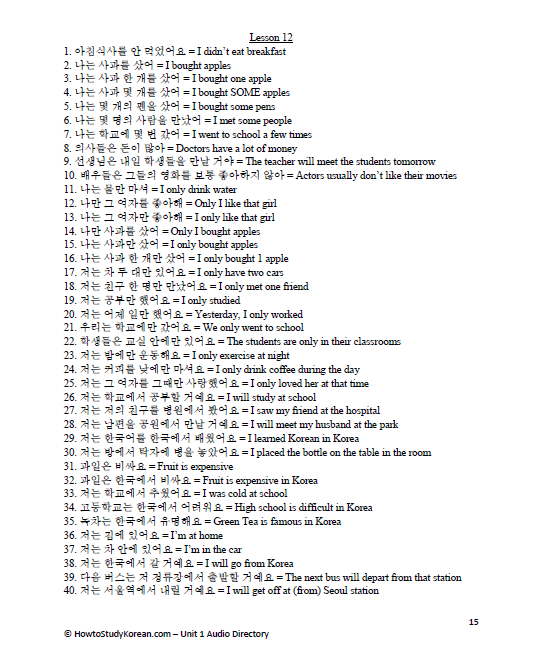 In the twenty five lessons of Unit 1, I explain the most fundamental aspects of Korean grammar. In Unit 2, I start to apply these basic concepts to more complicated sentences. I continue this application to many grammatical principles in Unit 3. My explanations are backed up with an enormous amount of examples that show how the explained grammar concepts fit into a Korean sentence. In total, there are 1,250 of these example sentences in Unit 1, 1200 in Unit 2 and 1200 in Unit 3. All of these example sentences on the website have an audio link that allows you to listen to a Korean person (my wife!) pronouncing the sentence. In addition, there are 1050 vocabulary words introduced in Unit 1, 800 vocabulary words introduced in Unit 2, and 625 vocabulary words introduced in Unit 3. All of these words on the website have an audio link that allows you to hear the correct pronunciation of each word. Using our website and the audio links is great, but users often want to have these audio files on their computer or mobile device to practice their listening on-the-go or when they are not connected to the internet. All of these audio files are available for download in packages. 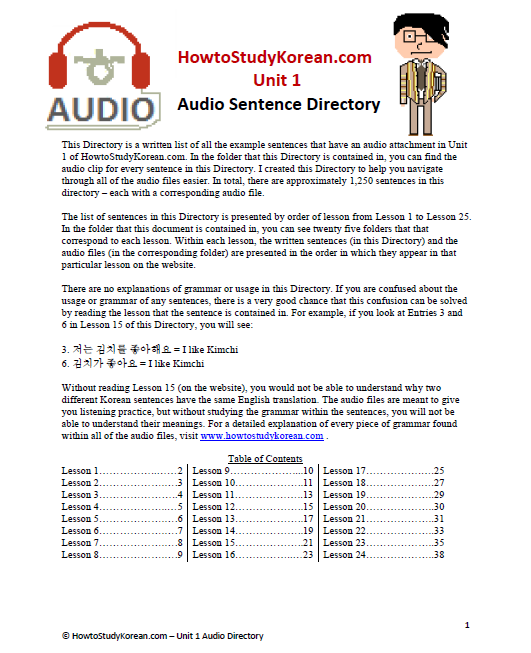 – For $5, you can download all of the audio files for the vocabulary words in Unit 1, Unit 2 or Unit 3. Each package comes organized in 25 folders – one folder for each lesson. Within each folder, the audio files are numbered in the order in which they are presented in their respective lessons. The files come organized in a “.zip” file. If you don’t know what that is, it basically just allows you to download a folder containing many files instead of just one file at a time. After you pay, you will receive an e-mail with instructions to download the file. If you have any questions, never hesitate to contact me. If you live in Korea, you could also send us the funds directly. If you prefer this, e-mail us at howtostudykorean@gmail.com .